Sometimes it’s easy to think that the cooler space is saturated. There seems to be a cooler company for just about every niche you can imagine. 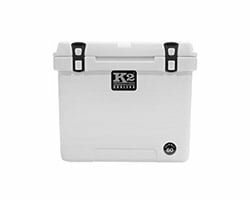 There are cooler brands for tailgating, there are brands for those who love premium coolers, there is a whole market for those who love to customize their coolers, and pretty much everything else. However, every time we think this, a new brand comes along and blows our minds, either by creating an entirely new niche we hadn’t thought of or by redefining an old one in ways we hadn’t imagined. Either way, we fall short most of the time and end up being schooled on the fact that there is always space for a new player on the coolers market; so long as they execute it right. Cascade Mountain Tech is one of those cooler brands that come along and redefine a niche you thought you perfectly understood. In this case, they make adventure so exciting that everyone on the team now wants to pack up and head over to the mountains for a couple of weeks. We don’t even know what we’re going to do there; we just want to go! 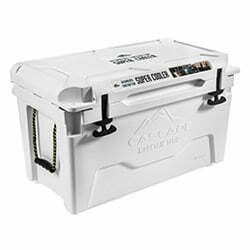 Cascade has breathed fresh air onto the adventure scene by introducing some pretty cool premium coolers that rival the very best names in the space, including Yeti (more on that later). But they went a step further.Most names in the space will be content with selling a few camo hard and soft coolers for adventurers and hunters and call themselves an adventure brand. Cascade Mountain Tech have gone a step further and sold some camping equipment along with their hard coolers and tumblers. You can buy camping chairs, LED lanterns, trekking poles, and many other products from these guys along with your cooler, giving you the sense that you’re getting everything under one roof. See what I mean? They have come along and redefined a niche we thought we knew like the back of our hands. Come to think of it I’m not even sure I know the back of my hands that well anymore! Having been founded by outdoor enthusiasts in the Pacific Northwest, this company is all about giving you affordable and achievable adventure and offers some great quality gear for your next adventure. 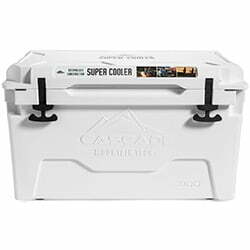 We loved them so much we had to do a review of their Cascade Mountain Tech Super Cooler. We’re pretty confident you’ll love it just as much as us. They’re young, but they have promise. As would be expected of a premium cooler like this one, the Cascade cooler is rotomolded. Rotomolded coolers are the best constructed coolers in the market today, being made from a single mold all around and having a hardy and durable build. These coolers can withstand nearly every kind of shock, stress, or strain without as much as a crack and they also happen to be extremely good insulators because of the fact that there aren’t any seams through which heat could be lost. 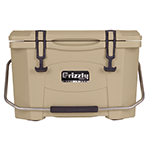 Oh, and by the way, just to show how incredibly tough the build on this cooler is, it’s certified bear-resistant! TIP: If you are looking for the best rotomolded cooler on the market, go and check out our top picks here. As for the design itself, the Cascade is pretty unassuming. It only comes in one color: white. Now, on the one hand, that seems like you don’t have much in the way of options with this cooler. What if you want a pink one (because pink is fashionable)? What if you want a camo one? Of course, that’s a sad fact. 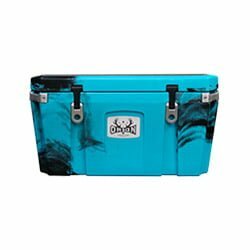 However, on the other hand, the design on this cooler is pretty good looking and has a sophisticated Yeti vibe to it. Don’t get us wrong; we’re not saying they ripped the Yeti design off. What we’re saying is that they have the same sophisticated feel to them. The edges aren’t too sharp but gently curve into the faces. 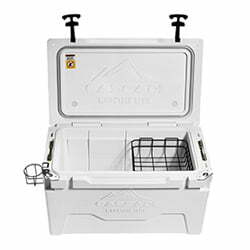 The ice chest itself has that familiar box shape we love in a cooler and tapers toward the bottom. In a way, it looks pure and perfect, the way an ideal cooler should look like. When you think about it from this perspective, it kind of makes sense that they would choose white to represent that purity we just mentioned. When it comes to the ice chest itself, we really love the amount of thought and engineering they invested in the foam. The foam on the inside is up to 3 inches thick. That means you’re getting some pretty good insulation with this cooler. The lid is also pretty strong, with a strong rubber gasket and some strong rubber latches to hold everything together. This is the kind of rubber latch that doesn’t get stuck once you secure it but can easily be pulled open. 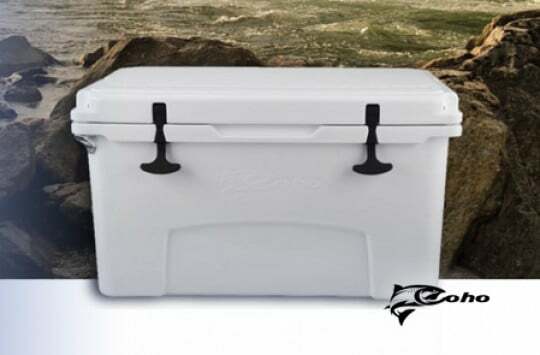 However, it still secures your cooler firmly so that it won’t fly open when you’re, say, driving on particularly bumpy terrain and the cooler gets shaken up in the back of the car. So you’ve got your cooler set and full of your favorite food and drinks and now you want to haul it over to your vehicle so you can start your journey into the wild. But wait, those plastic handles in the side look pretty uncomfortable. Not only that but they also look rather fragile. 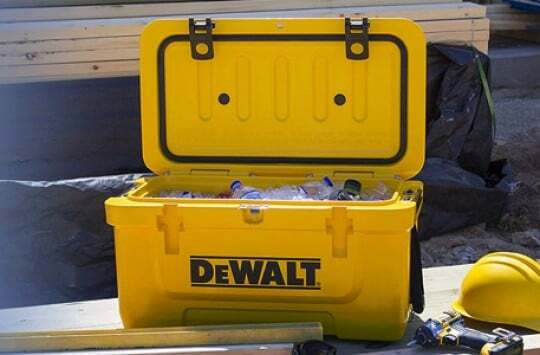 What if the cooler is too heavy and the handles break? What then? Well, you don’t have to worry about that with the Cascade Mountain cooler. 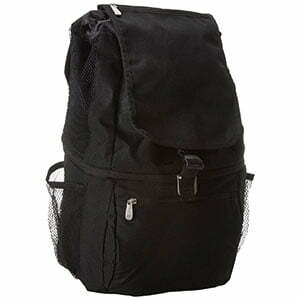 It has some pretty strong nylon rope handles on the side that you can use to easily carry your cooler. There is a rope handle on either side so you can enjoy the ergonomic advantage of carrying the cooler by the sides, rather than over the top. At the bottom, we have a drain plug for draining out your water. It comes with a latch so you don’t have to worry about losing the plug as soon as you take it out. On the corners of the lid are some bottle openers you can use to pop open your bottles of beer. 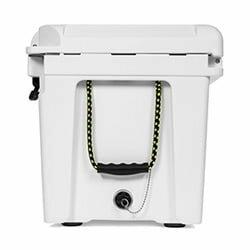 If you buy the larger 80-quart cooler, you also get to enjoy two cup holders on the outside, attached to the corners of the lid and a basket for the kind of stuff you want to keep dry on the inside of the cooler. Cup holder and basket included! The website announces the ice retention at 7 days. Now, that’s a major claim to make and so we decided to investigate it. We put in our drinks and filled the cooler half with ice. True to the claim, the ice was still there and our drinks were still chilly a full week later. We figured the ice could probably survive an extra day or two. A good cooler with good ice retention. What more can you ask for? TIP: To maximize ice retention try to use pre-chilled ice packs. Here are the ones we recommend. 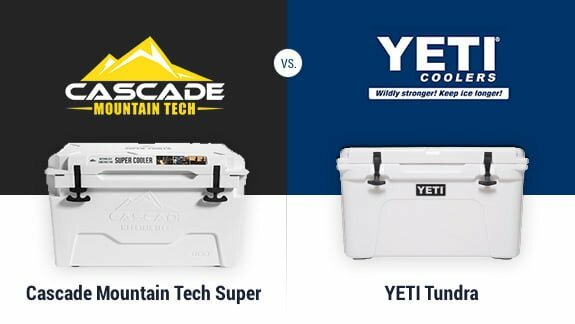 The Cascade Mountain Tech Super Cooler video to watch now! So now we get to our favorite part: comparing the incumbent to the industry leader. What can be said about these two is that the competition is pretty close in terms of performance. The ice retention is comparable and so is the build and construction. 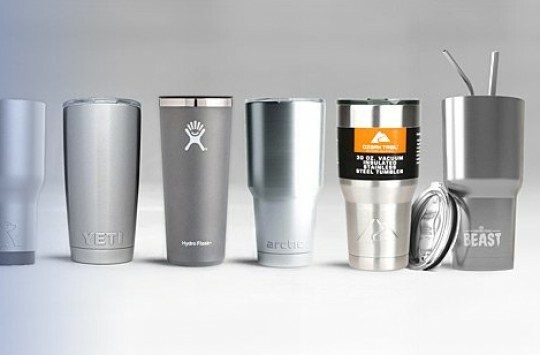 The Yeti beats the Cascade, though, when it comes to variety in terms of available colors and sizes, as well as customizability. But really it ends there. The Cascade is as good as any Yeti when it comes to performance. Both are premium coolers and both give you good value for money. 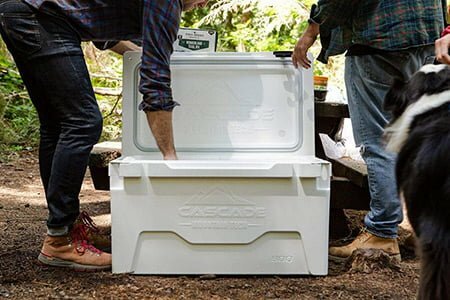 Yeti is an industry leader but you really won’t be disappointed with the Cascade either. We would advise you to check the price and simply pick whichever one you feel gives you a little more bang for your buck. 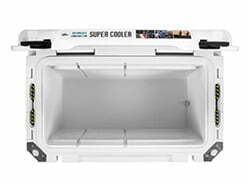 There are lots of places where you can buy this superb cooler but we recommend getting it from Amazon. You will enjoy loads of benefits when you make your purchase on Amazon. For starters, you get to read real reviews by real users just like you. That will make your decisions a lot more informed. You also get to enjoy free returns if you don’t like the product you’ve purchased and free shipping when you’re a Prime member. The Cascade Mountain Tech may be the new kid on the block but this kid has come with a bang. We can’t help but fall in love with it and we hope you do too.